This is a three-day weekend in the United States, where we will be celebrating Labor Day on Monday. Let the grilling begin! Wishing you a wonderful holiday weekend, dear bloggers. There will be no Mosaic Monday this week because of the holiday weekend in the United States. Mosaic Monday will return on Sunday, September 12th. Glad things are going well for you and your daughter. Your photograph as usual is stunning. What a darling girl to be happy and excited! So happy that you're doing well and that color in your photograph is scrumptious. Enjoy your weekend, too! Mary that photo is gorgeous, I need to learn how to use Photoshop and Paint...*sigh*! Sounds like you are holding up quite well, Mom! I'm glad your daughter is happy and I'm excited for her to be starting her next "great adventure." This photo is so beautiful!! Bright colors certainly do affect your mood, my rental ranch is FULL of bright colors as we needed a lot of "Happy" this past year. In fact, my friends call my place the happy house. Is there a better compliment? I think not. 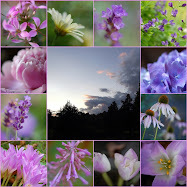 Enjoy your weekend and thanks again for your blog, I always enjoy it so much. Mary, Beautiful post! Our Chickie just started college this year, too, so we're making the same transition here. We are officially empty nesters, but that's not a bad thing! This shot is beautiful - it makes me happy. Have a wonderful weekend. I have to admit I have thought about you these past couple of days-- I recall when my kids went off to school and how I thought I would never be able to fill the days. I was amazed and simply saddened that my days filled up so fast! (heck I thought my life revolved around them) ... it did but now it's just full of other wonderful tasks. The wonderful part of them being away is that the anticpation of a call or visit is ENORMOUS! Wishing you tons of smiles-- I love your colors like you said... and yes they affect me so much! Beautiful color here, my friend. Makes me glad to read your happy words. Yeah! Love the background, Mary. It's just right! So pretty love it! I love coreopsis as well.I have a very small bush growing here.Next year it should be a bit bigger. Happy labor day to you!have a safe one! 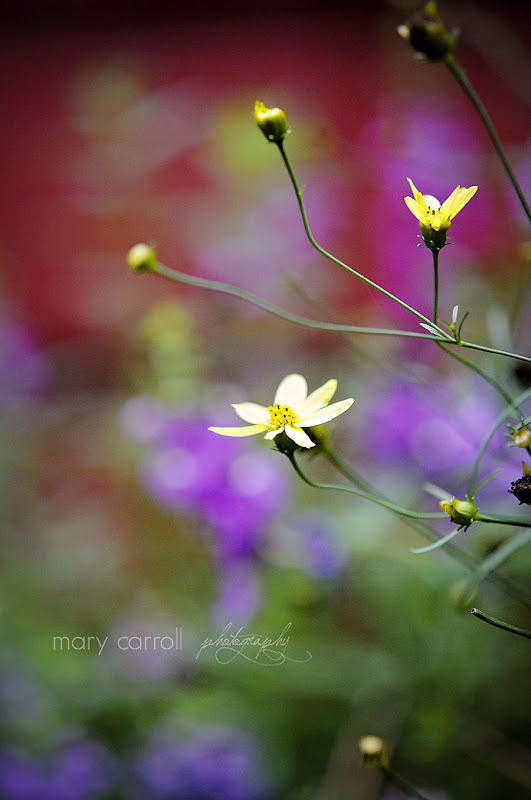 LOVE the Coreopsis 'Moonbeam." I planted it in a huge pot with strawberry popcorn, wallflower, and zinnias. It was a smashing counterpoint to the others. SO happy that you are happy. Love the bokeh in the photo. Very pretty. I'm so glad that your daughter is well. I can only imagine how difficult it must be. I don't look forward to those days. I'm having a hard enough time coping with my children going back to school, and they'll be home in my house by bedtime. Glad you're having fun with photoshop. I love the colorful bokeh..did you use texture to it? Mary, Great shot, it amazing what an f/stop can accomplish with the background. I am so glad your daughter is enjoying her time at college and you are filling your days with me time. Have a wonderful long weekend and take care. When they are happy...we are happy! I'm glad things are going well for you both! Have a nice night and day tomorrow. and will work on a Mosaic for the 12th. Beautiful photo! Hope you had a wonderful holiday weekend. It is hard when they leave the nest - but sometimes they come back, if only for a little while.